The tough Russian peasant who attacked Napoleon’s forces in 1812 is our image of the week. We’ve had a number of articles related to Russia on the site this week, so thought we’d make the image of the week Russia-related too. The 1812 Russian Campaign, or the French invasion of Russia, relates to Napoleon Bonaparte’s invasion of Russia during the Napoleonic Wars. The campaign was led by a huge French-led force of well over 500,000 troops. All did not go quite to Napoleon’s liking though, and the Russians were able to overcome the French to devastating effect. The defeat was a catastrophe for Napoleon and his dreams of control over Europe. 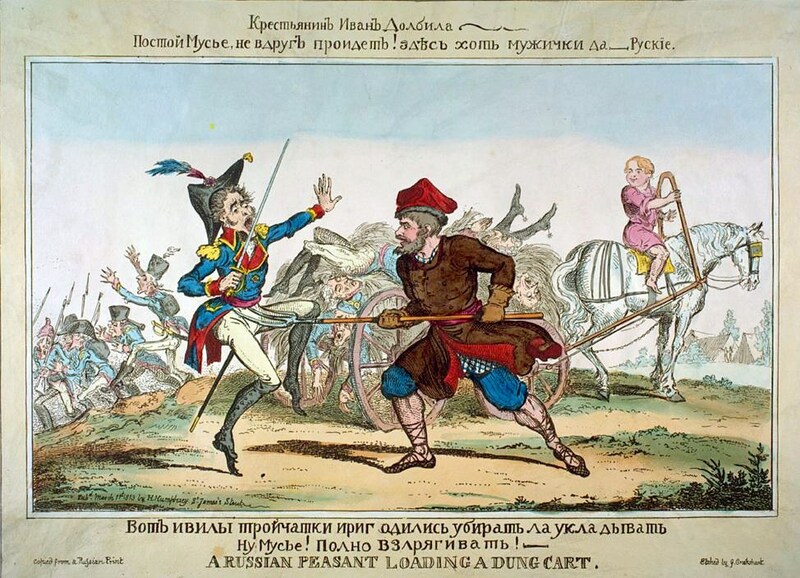 Our image is related to the Russian Campaign and says: “A Russian peasant loading a dung cart.” In the image, a hardy Russia peasant is about to attack a dainty French soldier with his pitchfork. The French soldier is terrified, even though he has a sword. In the background we can see why he is horrified – there is a dung cart full of the bodies of French troops among hay. A boy is also in the background, happily looking at the man’s attack on the French soldier. This print is from March 1813. What else Russia-related have you missed this week? Our article on famed Russian Grigori Rasputin is here and a podcast about Gulags is here.